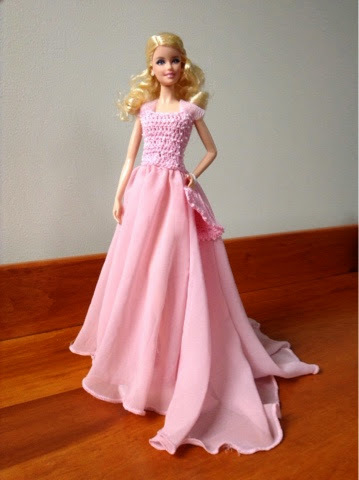 For this gown, I used one of my old ballet skirts for the skirt part of this dress. It is a great way to recycle old ballet skirts. It was fairly easy to make this dress, as the top did not have much shaping. It was harder to sew on the beads and skirt, but it was just minor sewing. A plus side of this dress is that there are tons of possibilities for decorating it. Be creative! This dress was actually inspired by the dress Emily wears to the Christmas ball in the Hallmark channel movie, A Royal Christmas. I just added sleeves, a higher neck, and a longer train. The fan was also added to the outfit. The gloves I am not sure how to make, but I will figure out something. I'm probably going to make more of what I call character outfits. What I mean is an outfit from or inspired by a character in a movie or an actress. I am planning on doing an outfit from each of my favorite movies. Some of the outfits I already have finished! I have this outfit, the red Annie dress from the new Annie movie, that is sized for Stacie, Barbie's little sister, an outfit inspired by Lorraine dance outfit from Back to the Future, and a Nancy Drew one getting ready to be crocheted. These outfit patterns will be posted here for free, so don't worry! I just need to look over the patterns and fix certain parts. Note: If you want a longer train in the back of the dress, use a longer skirt (maybe a size 14 or 16). Note: Before starting project, check over skirt for rips or stains. Remove tag. Row 1: With pink thread, ch 43, dc in 4th ch from hook, dc in each ch across, turn. Row 9: Ch 3, 1 dc in each of next 16 sts, 1 hdc in each of the next 3 sts, sc dec over next 2 sts, 1 hdc in each of the next 3 sts, 1 dc in each of next 16 sts. Fasten off. Weave in all ends. Sew white pearl beads onto top. Cut one piece of tulle 5 1/2 inches wide and 6 inches long. Fold tulle lengthwise and cut folded piece of tulle into 2 pieces of equal length. Pin tulle so it doesn't unfold. Sew tulle onto the top of the top part of the dress. Sew on pink lining onto the bottom of top. Carefully cut chiffon off of skirt. 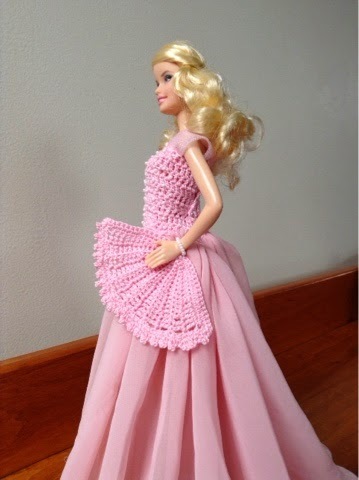 Gather chiffon to the circumference of Barbie's waist. Sew chiffon to the bottom of top. Row 1: Ch 17, sc in 2nd ch from hook, 1 sc in each of next 3 sts, 1 hdc in each of next 4 sts, 1 dc in each of next 4 sts, tr in each of last 4 sts, turn. Row 2: IN BACK LOOPS ONLY, ch 4, 1 tr in each of next 3 sts, 1 dc in each of next 4 sts, 1 hdc in each of next 4 sts, 1 sc in each of last 5 sts, turn. Row 3: IN BACK LOOPS ONLY, ch 1, 1 sc in each of next 4 sts, 1 hdc in each of next 4 sts, 1 dc in each of next 4 sts, 1 tr in each of last 4 sts, turn. Rows 4-12: Repeat rows 2 and 3 alternately. DO NOT FASTEN OFF. Ch 1, sc up row 12, 3 sc in last st. Now sc across the top of fan, 3 sc in last "st", sc down row 1, turn. Ch 1, 1 sc in each st to top of fan, ( sc, picot, sc) across top of fan, 1 sc in each sc down side of fan. Fasten off, leaving a long tail end. Use tail end to gather the bottom end (the narrower end) of the fan. Make a tassel and attach to fan. To make pearl bracelet that keeps fan on Barbie's wrist, thread pearl beads onto sewing thread and attach to fan. Rnd 1: With pink, ch 6, join to 1st ch. Fasten off. To add the pearls, I simply threaded the beads onto the tail ends and created loops of pearl beads. 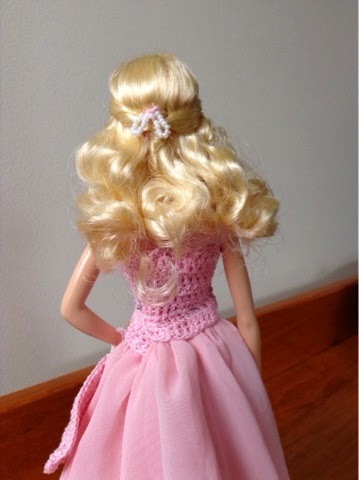 Leave long tail ends so you can tie it onto Barbie's ponytail or, if your doll has a hairdo like mine, simply pull the tail ends underneath the up part. How beautiful! This really shows great craftsmanship! Great work. This looks better than the dresses mattel sells for Barbies! I love the timeless and classic style. My niece would LOVE this! It's so pretty and, like Gabrielle says, much prettier than store-bought. I wonder if I can find a ballet skirt at a thrift store or some chiffon on the remnant rack at the fabric store. I have everything else on hand. Thank you! Yes, you probably could find an old ballet skirt at a thrift store or maybe find some chiffon at a fabric store. Thank you for commenting! Breathtaking gown. Love it. I've seen A Royal Christmas, and loved Emily's ballgown.